Caring for a cat can bring up many question. Chief among them – for our subject matter – is how often should you clean a litter box. Unless you have a self-cleaning litter box, the task of keeping your feline’s toilet clean probably falls on your shoulders. 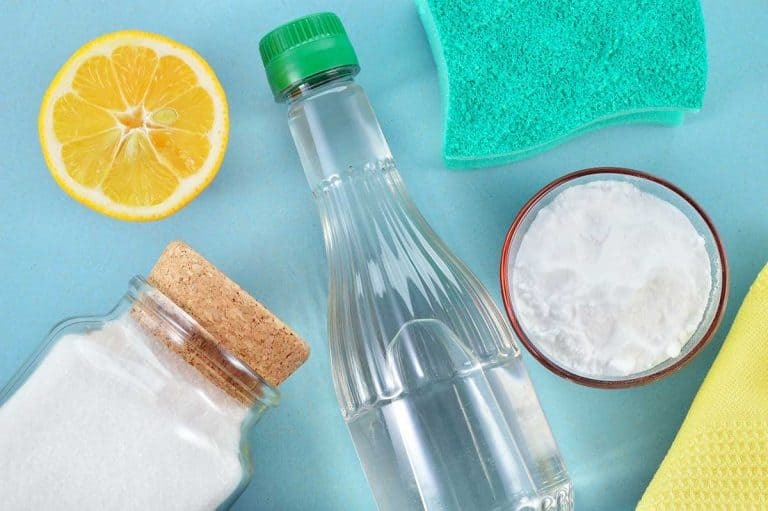 The least we can do is help you out with setting up a proper cleaning routine. How often should you clean a litter box – What does it even mean? How often should you scoop the litter? What about changing the litter (especially non-clumping litter). How often should you empty and thoroughly clean up the entire litter box? Clearly these are separate questions that can’t and shouldn’t have the same answer. In our experience, the question usually refers to the first meaning, i.e. how often should you scoop to make sure there are no clumps of urine or feces in a regular litter box with clumping litter. Rest assured, we’re not going to leave a single grain of litter unturned here. We’re going to provide you with concrete and specific answers to each of the three questions. First, we need to clarify some basic concepts relating to the litter box. Why is cleaning frequency important? To put it bluntly, cats use the litter box to urinate and defecate in. Feces and urine are biological substances that can be very smelly. Moreover, once they leave your cat’s body they begin to decompose and degrade by means of chemical and bacterial processes. The result is a fairly nasty odor that both humans and felines find obnoxious. The two main factors at play are water and oxygen. Water and oxygen are necessary for the growth of the bacteria that breaks down Kitty’s “produce”. The sooner you remove excrement and urine from your cat’s litter box, the better. Every second that they are exposed to air means more foul odors. Keeping them as dry as possible up to the point of final removal can help too which is what good litter does. How smelly will a litter box get? How long it’s been sitting in there. The more feces and urine clumps in the box, the stronger the smell. The urine of intact males or females in heat tends to smell much worse than that of neutered cats. What your cat eats – especially the amount of fat in the food – affects the smell of feces. Finally, the longer urine and feces have to interact with the air around the litter box, expect stronger more foul odors in that area. What if you’re not bothered by the smell? Some people are less sensitive than others to smell. You may even be suffering from anosmia – the inability to perceive odor. Does the question of “How often should you clean a litter box” have a different answer in your case? Not at all! You may not care about the smell but rest assured, your cat does. Cats have a very sensitive sense of smell and they’re clean animals by nature. If their litter box stinks, they will eventually avoid it and look for a cleaner place to use as their toilets. Very possibly your bed, living room rug or even your shoes. If you want your cat to use the litter box – and nothing but the litter box – for all their bathroom needs, it needs to be clean. No if’s and but’s. The only remaining question is the cleaning frequency required to keep it clean enough. Now that we know enough about why litter boxes smell when they’re dirty, let’s get back to the original question of how often should you clean a litter box. We’ll provide definitive answers to its three possible meanings for you as a cat owner. How often should you scoop a litter box? This is probably the most common interpretation of the question: How often should you clean a litter box, so let’s address this first. Scooping is the act of taking a good scoop and using it to rake the litter in search for feces. Once you find a clump, you lift it with the scoop, give it a couple of gentle shakes to lose extra litter and place it in a plastic bag. If you’re using clumping litter, you will be handling urine clumps in the same way. No scoop litter boxes – as the the name implies – mean you don’t have to actually hold a scoop and go through the raking and shaking motions. However, these boxes are not automated. You still have to manually initiate a litter sifting process. Which means the question of “How often to clean a litter box” still applies here, to the very act of getting feces and urine out of the box. Self-cleaning litter boxes are the only ones that can really save you some litter cleaning routine. They initiate litter cleaning on their own so you don’t have to worry about it. So how often should you scoop, or manually initiate litter cleaning? The answer is twice a day. If you allow feces and urine to sit in the box for more than a few hours, they will begin to smell. They smell a little right away but as long as their amount isn’t too high, you will probably not notice it during the first hours. If you have more than one litter box for your cat, you can reduce cleaning frequency to once a day. If you have more cats using the same litter box, you may need to clean more frequently. Some cats require that you clean the box after each and every use. Otherwise, they will do their business elsewhere. Some owners can manage that and others opt for a self-cleaning box with sensors that operate a cleaning cycle after each use. How often should you change the litter? Moving on to the second interpretation of the question: How often to clean a litter box. Changing the entire contents of a litter box isn’t just a question of frequency. 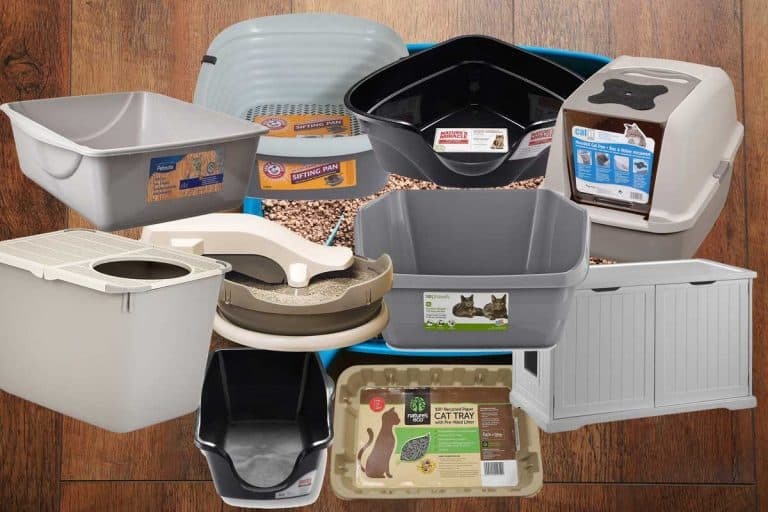 In fact, the real question is “should you even replace all of the litter in the box?” Many owners never do that and that can be ok.
How often should you change the litter when using clumping litter? Clumping litter is usually made of bentonite clay. When urine hits clumping litter, the grains stick together, solidifying the urine into round clump. Owners can then rake or scoop out the clumps of urine as if they were feces. The rest of the litter remains dry and granular. How often should you take out the entire contents of the box and replace it with fresh litter? Well, with clumping litter it doesn’t work like that. When using clumping litter, you simply add some litter to the box every two or three days, to replace the amount that went into forming the clumps and covering feces. That’s it. There really is no need to ever replace the rest of the litter, unless you’re doing a very thorough cleanup of the box itself (more on that later in this post). How often should you change the litter when using non-clumping litter? With non-clumping litter, the urine gets absorbed in the granules themselves. As you clean the box from feces, the urine-soaked granules simply get mixed in with the other granules. Some litters contain special granules in the mix which change their color as they absorb the urine. This can give you an indication as to how much urine has been absorbed in the box. Non-clumping litter has its limits. The tiny granules can soak up urine and absorb the odor only to a certain extent. Once you get past that point, you have to change the litter. Throw away the entire contents of the box and replace it with a new batch of non-clumping litter. So, how often should you do that? The best answer we can give you is to read the instructions on your litter package. There are many types of non-clumping litter and some may be more absorbent, lasting longer than others. As a rule of thumb, you should probably replace the entirety your non-clumping litter once every seven to ten days. But again, check with the manufacturer and follow their instructions. How often should you clean the litter box itself? Moving on to the third and last meaning of the question “How often to clean a litter box”. It’s time to talk about cleaning the litter box itself. 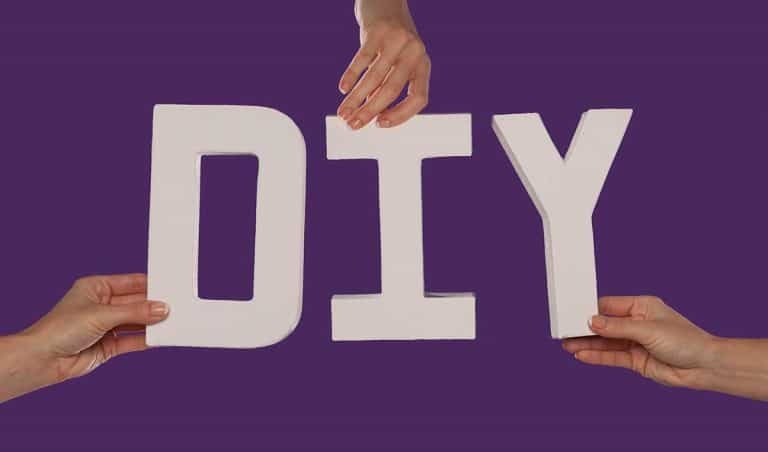 The cat’s litter box is almost always made of plastic – a durable and easy-to-clean material. Ideally, only the litter comes in direct contact with actual feces and urine, leaving the box itself clean. Cats throw litter around as they dig in the box and then later as they cover up. Feces and urine can get mixed into the litter, sticking into the walls of the box. Especially if the litter isn’t clean to begin with. If the cat digs deep enough, he will hit the bottom of the box and clear that area from litter. Feces and urine will then come in direct contact with the plastic. Using a thicker layer of litter can help prevent this from happening. Some cats urinate standing up, spraying the inner sides of the box. When using non-clumping litter, urine sometimes leaks through the granules and hits the bottom of the box. And when the waste comes in direct contact with the litter box, there’s cleaning to be done. How often should you clean a litter box itself? As soon as you notice the dirt. If you can see any signs of urine of feces on the plastic, just grab a wet wipe and clean them off. Don’t let them dry as they will be more difficult to remove. What about emptying the box from its contents and giving it a thorough wash? If you have can’t wipe the dirt off, then you would have to do that. Many owners routinely empty the box and wash it with soap and hot water. 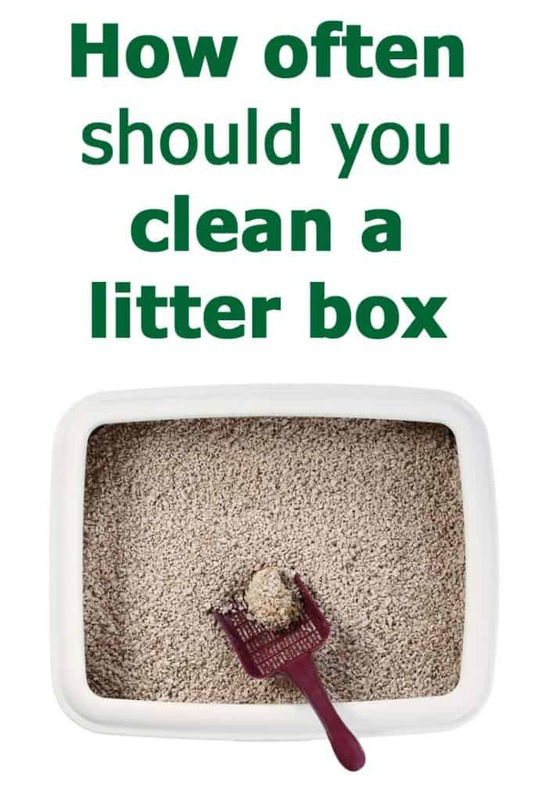 If you’re using non-clumping litter, check the box when you’re changing the litter. Seeing any signs of urine on the bottom, or any dirt elsewhere? That would be a good time to wash the box thoroughly. If you’re using clumping litter, just keep an eye out on the box. If you don’t notice any dirty patches and have no odor issues, it’s possible to just keep topping up the box. You can keep the full thorough wash down to once every few months or even a year. When it comes to cleaning the entire box, self-cleaning boxes present us with a unique case. These complex machines include much more than just a large plastic container. Additional components – such as a motor, metal rake and electronic sensors – make cleaning more difficult. So, how often to clean a litter box when you’re using a self-cleaning box? The answer here is to always follow the manufacturer’s instructions. These machines may save you time when it comes to daily litter box chores but they also require precise and delicate cleaning procedures. Using the wrong cleaning solution on the wrong part can cause malfunctions, so follow the instructions to the letter. As we’ve seen, with most boxes you need to clean the litter on a daily basis. Whether scooping or manually operating a sifting mechanism. What to do when you can’t be there to clean the litter box? The answer to the question of how often should you clean a litter box should never be “fewer times” even if you’re not there to do the cleaning. If you’re traveling for a few days, make sure your designated cat sitter does the cleaning instead. He or she should scoop or rake the box at least once a day – though twice a day is preferable. For longer periods of time, consider switching to a self-cleaning automatic litter box. That way you can rest assured your cat has a clean litter box even if you’re not able to do the scooping at the required intervals. Whatever you do, do not let Kitty deal with a dirty litter box. Don’t cover up the box to “prevent odors”. A cat’s litter box should never smell and if the smell bothers you, it definitely bothers your cat. Consider trying a different type of litter such as a quality clumping litter and increase the number of boxes as may be needed. Otherwise, just scoop more often. Let’s quickly recap what we have so far in our answers. Scoop at least once to twice a day. No need to replace the entire contents of the box. Clean the box as may be necessary by wiping off any stains. 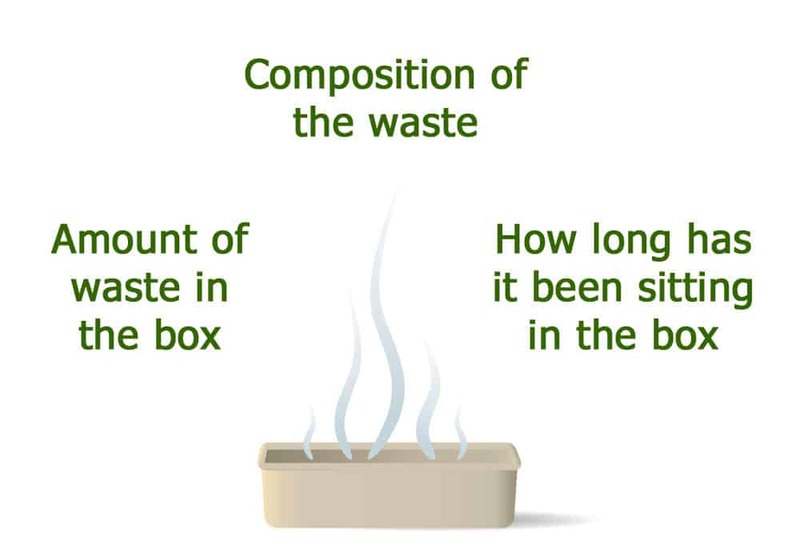 Replace the entire contents of the box once every 7-10 days or as per the litter manufacturer’s instructions. Clean the box as may be necessary by washing it when replacing the content of the box. How often should you clean a litter box when it’s an automatic self-cleaning box? Set the box to scoop at least once to twice a day. That’s it! Hopefully we covered every aspect of the question of how often should you clean a litter box. If you can think of any other questions, please do leave them in a comment below and we’ll do our best to answer! This was the best investment I’ve made for my cats! I keep it in a little used bathroom and change the tray once a week. I have 3 cats and a child who rarely visits! It is worth the money to me!!! After months they still scratch to cover their business sometimes. But it’s not an issue. Works great but now I need to get it set up to send me a 3 pack every 3 months automatically. They were hesitant at first so I kept their box there beside it for a couple of weeks. One day the old box was just gone and some (dirty) sand was in this new box. No accidents. No problems. They transitioned fine. My only problem is the sharp edges on the blue crystals. Need to wear slippers! I think you may have replied to the wrong post. Which litter box were you talking about?